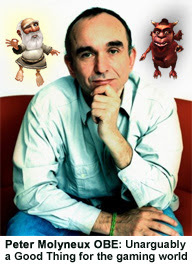 Good old Peter Molyneux. Maverick genius. Gaming god. Someone who is always pushing the bar higher and higher. His company, Lionhead, has recently worked hard attempting to take gaming to new levels by giving a player the freedom to make moral decisions with their in-game avatar, and so shape their future into one of either "good" or "evil". 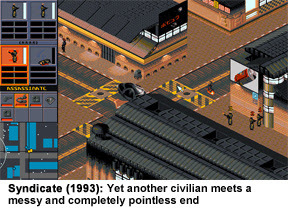 The idea is that by allowing a player to decide how to react to a situation, Molyneux hopes that they will become more emotionally involved and perhaps even learn something about themselves in the process. 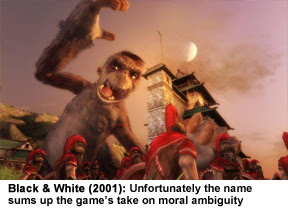 It's a great ambition, but in my opinion, the morally ambiguous Syndicate (1993) offered the player more moral freedom than Black & White (2001) or Fable (2004), despite these more recent games being designed specifically to offer this new type of gameplay. Is Peter Molyneux moving in the wrong direction, or am I just talking rubbish? In Syndicate, yes, you were working for a heartless, futuristic megacorp, taking out its competitors using the most underhanded and unscrupulous methods imaginable, but at least you were free to complete your missions in any way you saw fit. Meaning you could wait for the car to pass, or blow it up and cross the road immediately without fear of recrimination, losing "good" points or growing "devil" horns. Ok, it's not a great example of a moral dilemma, but at least the player was free to do what they wanted (provided they could handle the police response), without actually being judged for their actions. You see, as soon as you think there's some all-knowing, all-seeing deity watching over your every move, judging you, you start acting in a way to please them, instead of yourself. The idea of being watched and judged is the very foundation of control not freedom. It really irked me that Black & White's tag line was "Find out who you really are", as if the designers had created a flawless personality test that would reveal the truth about people. But the reality is that you can't make an honest decision if you think the game is going to judge you for it. What if I don't feel like helping that villager right now..... Well if I don't, my "good" rating will decrease, so I guess I better had. It's not really eliciting the 'emotional response' Molyneux has talked about, or providing a decent moral quandary, but instead turning "morality" into a "points based" system, and therefore a conscious decision to play the game a particular way. What's worse is that Black & White's two advisory characters, The Voices of "Good" and "Evil", have very explicit and self-conscious ideas about "right" and "wrong", when they really don't need to. "Evil" doesn't really exist in a real-world sense; it is usually a negative emotion, like apathy or fear, that leads to actions that are later judged as "bad", rather than someone making a conscious and premeditated attempt at doing something evil. Everybody thinks they're a good person. So, instead of Black & White's 'Voice of Evil' saying, "Let the villagers burn, why should you care about those little creatures... you're a god!" (paraphrase), he should say, in a fed-up tone of voice, "Ohhh, do we have to help them? I'm sure they'll be able to sort it out themselves. After all, they survived long enough before we arrived. Why do we need to interfere for every little thing? There's such a thing as nature..." I.e. Create a justifiable argument that might convince the player to do something arguably "bad". Even altering the scenarios so that players are tempted with a "fast reward" for doing something quick but not necessarily "good", would have tested a player's apathy and seen how prepared they were to do the "right" thing. Even if the game did work like this, I contend that it still shouldn't recognise "good" and "bad" actions. It shouldn't keep a tally in the way Black & White does: Play "bad" and your citadel turns "evil" looking, play "good" and it grows wings, gains a halo, and sprouts a rainbow, or something. Because, quite simply, you're still playing to the game designer's idea of right and wrong. A great alternative to this would be possible in something like Fable. Instead of the "universe" deciding how evil your character is, it could be judged by NPCs on an individual level. If games must insist on giving your evil avatar red glowing eyes, or your good avatar open-toed sandals, it would have been more interesting, and true to life, if it changed depending on how the NPC you were talking to viewed you (at least in Fable). For example, kill a NPC's husband and the next time you speak to her you will look "evil". Stop talking to her and you will look neutral again. Go talk to a father of the boy you saved and you will appear "angelic". If the people of a village hear of your misdeeds, you appear menacing when you enter the village, and normal again when you leave. Removing the idea of being judged and rewarded altogether would be best, though. It would create an infinitely more interesting, mature and ultimately more emotional experience for the player. Doing so would also allow the designers to create more complex quandaries, leaving the user to make up their own mind about the "right" decision, and experience the resulting consequences. Imagine having to seriously think about your character's reaction, rather than just making a simple, cartoony decision to play as "good" or "evil"; it could be very addictive and inspiring! 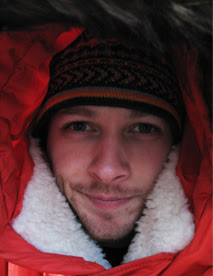 Friends and online communities might well begin arguing the "correct" action for a particular scenario in such a game, and with no-one to step in and play god, telling them who is right and wrong, we would all probably learn a lot more about ourselves in the process of discussing and justifying our decisions. The early moral quandaries might be simple, but as your progress into the game, they become more and more of a "grey" area and hence more difficult to decide about. I can imagine a future where games could really excel in this way, doing things that truly couldn't be followed by other media. Of course, this shouldn't all be laid as Molyneux's feet, as if he's to blame for the lack of such a game existing! If anything I should be praising him for pushing games towards such lofty ideas, and poking at other gaming companies for not even trying to do anything new. Who knows what the future of such games is, but fingers crossed Molyneux (or some other talented designer) will take all the ideas that Lionhead have injected into the gaming world, and turn them into something even more revolutionary. The 3rd picture is actually from Black and White 2, not 1. Besides this, that was pretty good! Shhh! I know, I just couldn't find a decent screenshot of Black & White 1. Thanks for your comments, though! The problem of the Black & White games is already in the title. Everything in the gameworld is either Black or White, good or evil. My long years of anime watching have taught me: in no war is one side evil and the other good. Every side has it's own motivation, every side has it's own methods, every side is right in their own point of view. Separating every action into good&evil brings up the question: good from the point of view of whom? Religion? Ethics? Law? If so which country's Religion/Ethics/Law? 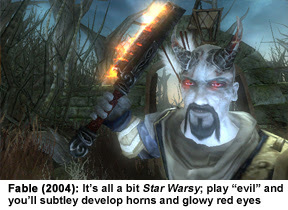 The guys at bioware understood this after walking down the same path with Kotor. Jade empire doesn't have good&evil. It has the paths of open palm (basically your good samaritan, helping everyone, "give a man a fish and he'll be fed for a day") and closed fist (more self centered, helping people help themselves,"teach a man to fish and he'll be fed his whole life"). So overall it's the point of view that matters. Forcing one's point of view onto another is the job of parents/government and the church. Leave it out of the games. In relation to what you said about moral authority: I wouldn't say moral codes are the job of parents or government or the church, for such things are still establishments of men. So we still run into yet another evel of "he says, she says" ambiguousness. Ultimately only a god or gods can dertimine what is right and wrong, if there is one, many, or whatever. Good article about video game morality, I hadn't thought of it that way before. Morality is determined by an era's zeitgeist, of which laws are the product of. The only cases its not the era's zeitgeist is in fiction where morality is determined by gods. As for the black and white games and the such, they take the zeitgeist of our current culture and superimpose it on the game such that you are judged in a real fashion according to our current understanding of human compassion. So yes, they do use a standard for morality and its our own current standard. Thanks for taking the time to post a comment, but I don't think you've understood the blog. It goes without saying that Lionhead's morality is based on our own current ideas of compassion, as the games would fail miserably if they decided to reward us for being "good" every time we did something cannibalistic. But even so, there are actually times in these games where the in-game morality might not necessarily equal your own. Despite what you've just said, there are plenty of grey areas in our society's understanding of compassion. One such example present in Black & White is eating meat. No matter how "good" you train your animal to be, if you train it to eat fish, it will turn evil, because eating animals is deemed "evil" within the game. You may not agree with that assessment of your actions. This really only highlights the need for this sort of thing to be changed. Cause and effect, rather than "invisible gods", should be our judge; we should reap what we sow... or at least that's what this article is suggesting. I kind of like the fish/wheat eating thing its an easy way to go from good to bad, without having to kill. The problem with tryin to perfect good and evil in a video is the fact that nobody agrees with what is good and what is evil. The grey area you refer to is so large that if a game developer tried to touch on it the contraversy would be so large the game wouldnt make the shelves. There for they try to keep with the "moral norm", to determine good and evil. I do agree that the appearance change would be more interesting if it was a perception change rather than permanent. Once again I think you've missed the point. Instead of being told what is "good" or "evil", simply program the NPCs in the game to have a somewhat realistic reaction to your behaviour. Kill someone's relative/friend and they'll dislike you, possibly making a future mission where they could have helped you more difficult.